While searching for a tropical paradise to escape sub-zero Christmas temperatures, Sri Lanka was recommended by cycling friends. The pictures impressed. Kurt would get his mountains and Darina would have her fair share of beaches. Temperatures shouldn’t rise above 32°C… and all we wanted was a bit of sun anyway. We were sold! The only doubt we had was when we were asked: Is that not a bit mainstream for you two? Arriving at 3 am is not normally what we would do, but our first hotel offered a round-the-clock pick-up service, so we were able to have a snooze until it was time for a late breakfast and a first explore. With temperatures hovering around the 30°C mark, the pool was also quite inviting after our acclimatization spin. Bala in the highlands That evening, we had dinner with Bala, our Indian cycling friend, who had just finished his 3-week trip around the country. So, we got a lot of valuable first-hand information and social life all in one. Cheers Bala! With sundown at 6pm, and not willing to face the hectic Christmas traffic, we hopped in a tuk-tuk. This was actually an invaluable experience as it allowed us to see the traffic from a different perspective. Not only that, it was also reassuring to see how competent the tuk-tuk drivers were at breaking and respecting the space of pedestrians and cyclists. Next day we cycled mostly on quiet secondary roads along the coast to Chilaw, where we stayed at Athina Guest house. Kurt was in the kitchen as they cooked dinner, so if you’re not afraid of chillies, let us know the next time you visit, and he’ll try to reproduce that fine dish: Devilled prawns. The big attraction in Chilaw is the fabulous Sri Munneswaram Hindu Temple about 2 km outside town. As it happened, it was festival time and dozens of pilgrims were arriving with their offerings of flowers and fruit, after having fasted for weeks on end. Many regional roads have a hard shoulder. Thinning out the rice From here, we stuck to quiet country roads to Anuradhapura. Blissful cycling past paddy fields, coconut palms and very friendly people. There were two logical reasons for seeking out all these beautiful quiet roads. Traffic in built-up areas is hectic, to say the least. Tuk-tuk drivers are to be trusted, but you need to have your wits about you all the same. Bus drivers, on the other hand, are a law onto themselves. The slogan on this bus below says it all: We ride together, we die together! We ride together, we die together! The second good reason for cycling unfrequented country roads, is to reduce exposure to horrific black exhaust fumes. While by law, all new vehicles have to be tested for carbon monoxide and hydrocarbon emissions, those manufactured prior to 1975 are exempt! We can only assume that we encountered quite a few of the latter! Rust: area claimed by Tamil Tigers Sri Lanka’s civil war lasted almost 27 years and ended in 2009 when the Sinhalese Sri Lankan army defeated the Tamil Tigers (LTTE), who had been struggling for an independent state for the Tamil majority in the north and east of the country. Almost 100,000 died during the course of this conflict and the country suffered greatly. In an attempt to rebuild a strong and diverse nation, the Ministery for National Co-existence, Dialogue and Official Languages was established in 2015 to promote mutual respect, while ensuring the rights of all communities. Coexistence villages have been set up throughout the country to encourage members of both communities to live together, and the two official languages (Sinhalese and Tamil) are taught in all public schools. Numerous youth projects encourage mutual understanding between the two communities and those we spoke to were very open to all these innovative moves. Darina: What does that sign mean? Local lady: Elephants on road. Darina: And what should we do? Local lady: (Long pause) Be afraid! To give Kurt his due, we did come across election posters sporting elephants! Every political party has a characteristic picture (E.g. elephant, lotus, tractor, pagoda etc.) so that voters can easily recognize the party of their choice on the ballot paper. Be brave, be very brave! Having decided that a haircut was necessary before going on the temple tour, Kurt pulled up outside a salon advertising very adventurous hairstyles. We couldn’t read the name of the salon, so it could well have been The Blood of Jesus Barber Shop of Ghana fame! Sometimes it helps to be illiterate! For an insight into the 4€ worth of damage, scroll down! All spruced up, we went to see the world’s oldest living human-planted tree. Growing in Anuradhapura for 2,500 years, this Bodhi fig tree is a direct descendant of the one that gave shade to Buddha during his enlightenment. Judging by the huge golden props supporting its heaving branches, it will be around for another few years! Propped up for dear life! Pilgrims with their flower offerings A lot of impressively big stupas dot the area of this former Sri Lankan capital (4th century BC- 11th century AD). Droves of pilgrims, clad in white, circled the stupas singing and chanting before placing their offerings in front of the main Buddha icon. Meanwhile, the snake charmer fluted away outside, and street vendors were at hand to fulfill your every need! 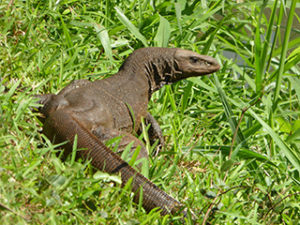 There was no shortage of monkeys, lizards and squirrels of all shapes and sizes on the roadside and outside the temples. Our favourites were these cute Sri Lankan grey langurs. Climbing up for a viewpoint Mihintale, 15 km to the east of Anuradhapura was the place where an Indian monk converted the local king to Buddhism. 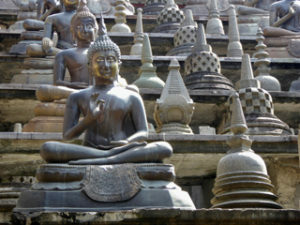 This event turned the place into an auspicious spot for a monastery and a few stupas. A main road, smooth as silk, brought us to Sigiriya. On the top of this huge 200m high volcanic plug sits a magnificent fortress complete with water pools … and there’s a fascinating story behind it! The Lion’s Gate In the year 477AD, Prince Kashyapa, second in line to the throne, buried his father (the King) alive and in doing so scared the daylights out of his brother (the rightful heir), who fled to south India. Kashyapa usurped the throne, built this amazing fortress and pleasure palace on top of the rock and ruled for 18 years. When the rightful heir returned from exile and won back the throne, he had no use for this hilltop fort, and so it was turned into a Buddhist monastery, which lasted until the 14th century. Although, it has decayed over the centuries, the remains are still very impressive and worth the entrance fee. Dambulla Buddhist cave temples Dambulla’s cave temples were our highlight on the spiritual front. 5 caves full of Buddhas in 2 and 3D, most of them finely and colourfully executed, should definitely make their way onto every Sri-Lankan must-see list. The search for the well-hidden ticket office for foreigners is an added adventure thrown in for good measure! Thanks to Google Maps, we had delightful country roads and a blissful ride to Matale, where we spent a good hour in the fabulous Sri Muthumariamman Kovil Hindu Temple. Hindus, Buddhists, Muslims and Christians live in perfect harmony, and what’s more, they all celebrate each other’s religious festivals together! What d’ya make of that, Ted? New Year’s blessing The next morning, our breakfast joint was full of worshipers that had spent the night praying at the Buddhist temple across the road. We were included in the festivities, invited for breakfast and bestowed blessings in the temple. Sufficiently fortified and protected, we started the new year rolling on side roads into Kandy, another former capital. Kandy is renowned for its beautiful lake setting, and the Temple of the Tooth in the Royal Palace complex. Buddha’s tooth relic is bathed every Wednesday and this holy water is believed to have healing powers. Kurt was raging we didn’t arrive mid-week, as he reckoned said water might save him a couple of bob at the dentist’s! At the fruit market After a stroll through the market and around the lake, we immersed ourselves in British colonial style with a night cap in the Queen’s Hotel bar. For us, the Peradeniya botanical gardens were the best part of Kandy! These beautifully landscaped gardens are full of spice trees, palms, bamboos and orchids to name just a few. Flying foxes hung from trees like Christmas decorations, admittedly smellier than your traditional baubles, but way more original any day! The wedding season The botanical gardens are the perfect backdrop for a few hundred wedding snaps. Actually, arranged marriages are still quite common in Sri Lanka and the bride’s family is expected to deliver a substantial dowry. Young brides-to-be, having met their future husband once (if at all), described the adventure as both exciting and nerve wracking. One afternoon, Darina was flagged down by a gravedigger intent on showing off his latest masterpiece. Attractively decorated with colourful sawdust, the plot was almost complete for the funeral entourage that would arrive in a couple of hours. There was no convincing Kurt to wait for the ceremony – he will never understand the Irish fascination for a good wake! Tea plantations As we gained altitude, the landscape changed from paddy fields to spice gardens to tea plantations. It was hard work climbing, but the views were rewarding. Nuwara Eliya is the most important center for tea production in Sri Lanka. Situated around 2000 masl, it is definitely not a hotspot. Actually, we needed 2 thick blankets to keep warm in our room. Often referred to as Little England, it was a hill retreat for the British who ruled Sri Lanka from 1815-1948. Numerous buildings around town, as well as the golf club and race track, are reminiscent of this colonial era. Cricket is still a very popular sport all over the country. Felt like home! The road south wouldn’t look out of place in Ireland or New Zealand. Dairy farms abound, and one of the bigger coops is actually named New Zealand Farm, producing Anchor milk from thousands of local farming families. Until then, we were always perplexed when the locals proudly sold us New Zealand Anchor yoghurt/milk! After the rolling hills and a number of wind farms, the forest turned into jungle, complete with fern trees (to stick with the NZ theme). The ascent to Horton Plains NP A few steep hairpin bends later, we were at the Horton Plains National Park. The $20 entrance fee was a little steep for the cheap tarmac that we followed through the park. We both enjoyed the ride there and away, Darina even liked the dull grasslands within the park confines, while Kurt reckoned that you would see more wildlife on cow dung than in Horton Plains! Oops! That was until the fog rolled in, the tractor path turned into uncut stone slabs, loose gravel, muck, river and totally-uncalled-for uphills, which had us pushing for most of the afternoon. By the time we hit the main road, it was dark, and we had missed lunch. Kurt admits that as far as navigation is concerned, this has got to be his biggest blunder ever! And you call this downhill? However, thanks to Faiz and his wife at Hamadhi Guest House, the day ended on a high note. Not only did they have a lovely room for us, but they also cooked up a storm while we enjoyed our well-earned shower. We were mega impressed with the numerous delicious curries they managed to rustle up in 45 minutes and can highly recommend the place. Bungalow in the forest Udawalawe National Park was our next stop. This was the first place, where we had to try 5 or 6 guest houses before finding a room. This should have been a warning about the number of tourists in town. We ended up staying in the Blue Sapphire guest house, where had an exquisite bungalow in the forest and another fantastic home-cooked rice and curry spread. Curry and rice at the Blue Sapphire Guest House. The next morning, we were at the NP entrance bright and early at 6am. Alas, we were not the only ones with that idea, as hundreds of jeeps were there ahead of us! This was really the first destination that we had to share with such crowds. The information boards on display at the ticket office are well-worth reading for trivia about these fascinating creatures. Moo! The park is famous for its 600 elephants and in the beginning all you had to spot was a cluster of jeeps to know where they were! It didn’t take long for the crowds to disperse, and after 100 Elephants and 500 pics of these pachyderms, we did become a bit blasé about them. So then, we started bird watching. This is easy enough since most of them are brilliantly colored or big and- in the case of the very common peacocks- both. Spotted deer, water buffaloes and a crocodile rounded off the experience. We were duly impressed! Pulling in the nets After all these rice fields, tea plantations and forests, it was time for a beach. We hit the first one in Tangalle, where there were more tourists than local fishermen pulling in the nets. Tipped off by a French couple, we proceeded to Silent beach, about 6km west, where we had our Maldives experience! Most of this marvellous beach is part of a 5-star resort, but for the likes of us there are guesthouses left and right of the luxury accommodation. Our candle-lit dinner on the beach was exclusive, and to top off the romantic aspect, fireflies lit our way home. Low tide in Weligama Following the south coast west, we realized that this is where the tourists congregate. Colourful fishing boats and surf schools dotted the palm-fringed beaches, and we heard every conceivable European language as we cycled past. This was the area that was hit by the tsunami in December 2004. 30,000 died and 1.5 million were displaced from their homes as a result. Today, the relief work is evident in state-of-the-art bridges with bicycles lanes, and countless new hotels and guesthouses. Business is booming, and one town has even earned the title: Tourist zone! Longford meets Weligama Darina tipped down to the beach in Weligama to take a few snaps, when lo and behold she came across a boat called “An Longphuirt” (a variation of the Irish word for Darina’s home town). Local knowledge concluded that it was a donation in the aftermath of the tsunami, when most local fishermen had lost everything they owned. One tradition in Sri Lanka is stilt fishing. 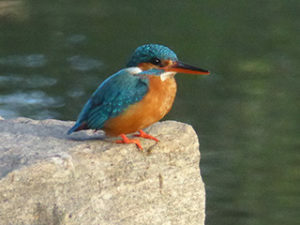 Perched upon a pole, the fishermen cast little or no shadow on the water and can thus be more successful with their catch. Actually, in recent years, they have discovered that real success is having a partner on the shore to charge the tourists for pics! When we arrived, there were neither fishermen nor touts, so Darina sent Kurt up the pole for a Gone-Fish-About moment! Entrance through the city wall The historic fort of Galle was built by the Portuguese during their occupation from 1505-1658 and later fortified by the Dutch who ruled from 1658-1796. We checked into the Rampart view Guest house (highly recommended by our friends Elke and Markus) and soaked up the atmosphere of this colonial gem. These crazy jumpers have been throwing themselves off the ramparts since 1998. For $20, they will do a few spectacular jumps into the ocean, even if it is less than a meter deep. Scary stuff! There was no one willing to finance a possible suicide attempt the evening we were there! The Steuart Hotel, Colombo We decided to organize a minivan to bring us to Colombo. After all the lovely cycling, we didn’t want to destroy our memories with an overdose of hectic roads. We ended up in the Steuart Hotel in Colombo Fort, where our bikes got a prime parking spot on the Scottish tartan carpet in our huge modern room. Colombo is an exciting mix of colonial buildings, national monuments, sugar-candy coloured mosques and temples, as well as modern shiny high rise. Many of the official buildings like the Town Hall and the National Museum etc. would blend perfectly into Washington DC. 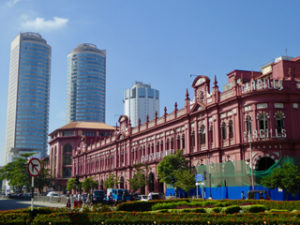 The Arcade Shopping Centre at Independence Square is one of the many post-war undertakings to project Colombo as a modern innovative city. Before renovating this former psychiatric hospital, local architects were sent to Paris to explore heritage buildings and the hallmarks of a planned city. The impressive result has great attention to detail and will certainly enhance every shopping excursion! Sri Lanka is an absolute mecca for food lovers and has been influenced over the centuries by foreign trade and colonial powers. We ate like kings on a daily basis and were very impressed with the hygiene standards. The breakfast spread Breakfasts varied from omelettes to pancakes stuffed with a sweet coconut filling, hoppers (pancakes made with rice flour and coconut milk), roti (flat bread) or rice and curry with papadums (chickpea flour crackers). Sweet milk tea and tropical fruit were standard additions. Prices varied from 1- 3€ /person. Sweets A bunch of ladies called us over one day as we cycled through the rice fields. They were having an open day to launch their sweets trolley in front of a school, and we had to try everything! A lengthy photo shoot ensued before we hit the road again. Stutiyi! Dinner was similar to lunch and many guesthouses were able to whip up a storm at very short notice. We generally paid between 2 and 4€ / person. Pranobaa Guesthouse, Kandy A double room with private bathroom cost between 8 and 20€ depending on whether there was air con or a fan. Actually, for the first 10 days, we felt quite unique, as we were the only guests in every hotel we frequented. That’s what happens, when you don’t use booking.com. In Colombo and Galle, prices for centrally-located rooms were more like 40-60€ a night. Sri Lankans are a gentle, genuinely friendly folk that are very willing to please. With a population of almost 21 million in an area slightly smaller than the Republic of Ireland, a helping hand is never far away! We felt very welcome and safe at all times, but of course, avoided busy roads where possible. Mad for a pic with the tourist! Thumbs up for Sri Lanka! It may be true that we generally recommend the places we visit, but Sri Lanka is really one outstanding destination for cyclists. The route can be as varied as you like, from beaches to mountains, from rice fields to tea plantations, and from forests to temples. Just mark a few spots on the map and connect them with a pleasant spin. Logistics are as easy as they get. We found good food and clean accommodation everywhere, and if you want to hitch a ride it won’t take more than 15 mins to organize a mini-van. Roads lead in all directions and even getting lost has its charm – just don’t take our shortcut from the Horton Plains NP! 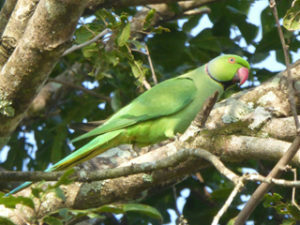 Main stream or not, Sri Lanka is the spot!